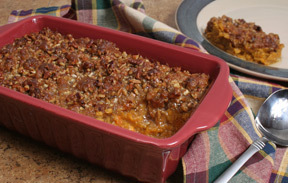 Pineapple and sweet potatoes create a delicious flavor combination that adds spice to a holiday meal. 1. Preheat oven to 350°F. Drain pineapple, reserving 1/4 cup juice. Mix reserved juice with sweet potatoes, granulated sugar, 2 tablespoons melted butter, vanilla and 1 teaspoon of the pumpkin pie spice (or 1 teaspoon of the cinnamon). Pour into lightly greased 2-quart baking dish. Top with crushed pineapple. 2. 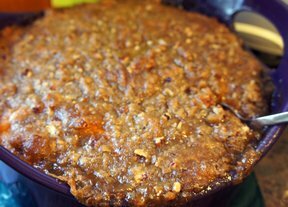 Mix brown sugar, 1/4 cup butter and remaining 1 teaspoon pumpkin pie spice (or 1/2 teaspoon cinnamon) in small saucepan. Cook and stir on medium heat just until sugar dissolves. Stir in nuts. Spoon over sweet potato and pineapple mixture. 3. Bake 35 to 40 minutes or until lightly browned and heated through.